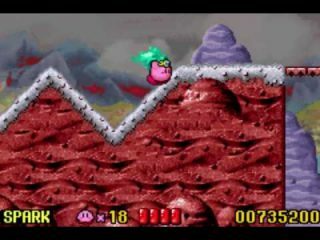 Kirby after a jump, spitting out an enemy in form of a star. Now, that doesn’t mean I don’t like Kirby, far from it. Kirby might just well be one of my favorite videogame characters of all time. Not for nothing, the logo of my channel featured Kirby for a long time. I like Kirby due to his peculiar ability of being able to use the power of the enemies he confronts, making him a very versatile character. I remember when playing Super Smash Bros Brawl he was my choise in any difficult scenarios due to him being very poweruful. In Kirby Nightmare in Dreamland the story tells about king Dedede who stole the magical Star Rod from the Fountain of Dreams and now the people start having nightmares. 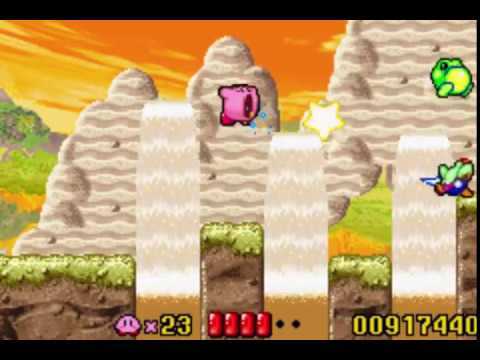 Kirby is then summoned from the stars to come to Dreamland and recover the Star Rod from king Dedede. Not only that, but later on the game if you want to get your 100% on the game file, you’ll have to explore carefully the levels and, by using certain abilities, open up a path which lead to some secret button that you have to press. This adds some exploring to what otherwise is a simple and straight forward platform game. Even though, Kirby is able to completly ignore the platforms and freely fly arund the screen at any time. In any case, Kirby Nightmare in Dreamland is indeed a fun game. And from time to time, I always like to play it again from the beginning to the end.